The recent gift of a Syracuse University alumna and her family is bringing a big smile to the Bernice M. Wright (BMW) Child Development Laboratory School every day. Literally. 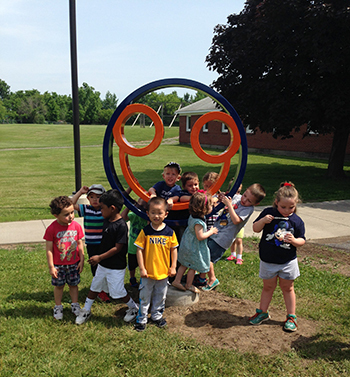 Children gather around the happy face sculpture created by Scott Gerber and installed recently near the Bernice M. Wright Lab School. Earlier this month, a 12-foot blue and orange “happy face” sculpture was installed outside of the BMW Lab School on South Campus, a gift from Shelly and Scot Fisher. Shelly is an alumna of the Newhouse School, as is their son, Sam. The artist, Scott Gerber, created the piece in his studio in Sarasota, Fla. In the near future, four of his full-body sculptures will appear on New York City’s Riverwalk. The SU version of the happy-face sculpture has a front that is blue and a back that is orange. The face is four feet in diameter. Its finish has the same paint used on Learjets, making it weatherproof for Syracuse winters. According to BMW Director Daria Webber ’84, G’89, the sculpture will quickly become a defining feature of the school’s landscape when the new semester begins in August. On the day of the sculpture’s arrival, the students spent the morning on the front lawn exploring it. “The very first child who saw it ran into the school excitedly and said, ‘I just saw a happy face outside!’ At this point, teachers are thinking how it might be incorporated into their activities. It may involve a project sculpting clay in our new art studio in the fall,” adds Webber. The BMW school serves children of diverse backgrounds and abilities between the ages of two and five years old. Located in the Falk College’s Department of Child and Family Studies, the school serves Syracuse University as a laboratory school in early childhood education and research.